Sometimes a website builder comes along and works so well that it changes the game for everyone. Homestead did that when it debuted in the ‘90s, but how does the platform hold up by today’s standards? 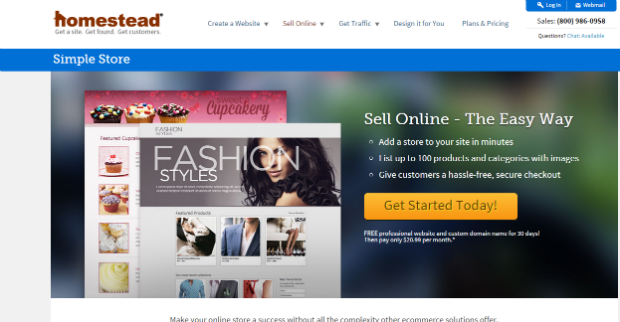 Founded in 1996 and headquartered in Burlington, Massachusetts, Homestead is one of the longest-standing website builders on the market. 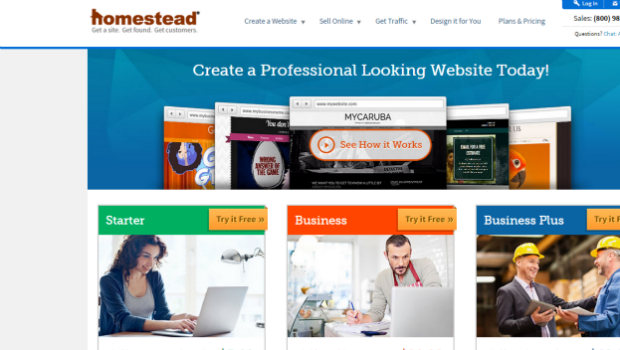 For almost two decades, business owners around the world have used this intuitive tool to create Homestead websites for all sorts of enterprises. The Homestead website builder includes hundreds of design templates to browse through, and offers ecommerce and SEO functionality as well. Homestead is free to use for the first 30 days, though I did need to enter my credit card info as part of the account signup process. Beyond the first month, I can continue to use builder for as low as $5.99 per month, and cancel whenever I want. In the past, this company enabled website creation by means of a downloadable design program called the Homestead SiteBuilder. That tool has since been retired, and Homestead now uses a much more modern and easier-to-use Web-based builder. Today’s Homestead site builder is a great choice for first-time small-business owners interested in promoting themselves online. Even business owners with zero design experience or coding know-how won’t have a problem building great-looking Homestead websites in minutes. There are hundreds of Homestead website templates to browse through in the theme gallery. The templates aren’t too flashy, but they’re certainly attractive and well-organized. To help you find the perfect one, the themes can be filtered four ways: business type, website personality, website purpose, and target customer. For example, when searching by business type, your template options include everything from artist to automotive, fashion to fitness, and travel to technology. The selections under website purpose include events, membership, portfolio, and product catalog. To match your theme to your content’s personality, you can select from classic, modern, laidback, earthy, and exciting styles. And for a customer-focused design, select looks that are geared toward families, teens, seniors, small businesses, or employers. With Homestead, selecting a template isn’t a decision that should be rushed. Take your time choosing the template for you, because if you want to change it later, you’ll have to start over from scratch. After creating an account and signing up for the Business package, I used my Homestead login to begin the site-building process. I chose a template and was taken to the drag-and-drop builder, which worked pretty much like most other builders, except the dock of Web elements runs across the top of the screen, rather than the side. I started with a home page, and was able to add four additional pages to my site. These page types include products, services, photo gallery, contact page, clients, and partners in addition to a few others. The software wizard guided me through the steps of setting of my first page, and the process was simple enough that I didn’t require much more help. I had never used Homestead before working on this review, and, honestly, my expectations were pretty low. I’m happy to say that I was surprised by how simple and straightforward the entire platform is, though. I found Homestead surprisingly simple to use and it was refreshing to try out a builder that didn’t attempt to trick or upsell me at every possible occasion. The builder had more options than I thought it would, and it was every bit as easy to use as other builders. Overall, I was pleased by how easy Homestead Web design was, but the platform still doesn’t offer all features as the most modern builders. Although Homestead’s pricing plans aren’t the most affordable on the market, I respect the fact that this company clearly advertises their actual rates, and doesn’t require the user to read the fine print. And even though there are a few add-ons that can increase the price you pay, Homestead doesn’t use hard-selling tactics to get you to sign up for things you don’t need. All of the packages include access to the website builder, which includes hundreds of customizable templates and over 1 million royalty-free images for you to use. You also get access to phone, chat, and community support, along with statistics about your site’s traffic. One area where Homestead falls miserably short, is when it comes to mobile websites. The websites don’t adapt well to mobile screens, and the Homestead Web builder doesn’t provide any options at all when it comes to mobile sites. With Homestead, it’s as if the mobile Web doesn’t even exist, and that’s a shame. Though you could theoretically use the site builder in Homestead to place PayPal buttons anywhere on your site, true ecommerce functionality isn’t included with any of this company’s three main pricing plans. Instead, there are two separate Homestead website services for ecommerce: SimpleStore, which is an additional $14.99 per month, and Advanced Ecommerce, which requires a call to (800) 986-0958 to get a quote. SimpleStore is a cool little tool from Homestead Web services that allows you to sell up to 100 products right on your website. You can add photos, SKUs, a shipping charge, and a product category for each item. As the name of this add-on reveals, though, there’s not too much to SimpleStore, and it lacks the reporting and inventory management features common on modern ecommerce platforms. If you want more options for your online shop, Homestead’s Advanced Store package offers the ability to sell more products, and includes the inventory management and reporting features missing from SimpleStore. You can also use Advanced Store to help you find shipping options and sell your stuff in other online marketplaces, such as eBay. Though I didn’t need it much, I had a good experience with Homestead’s website support. The support forum had answers to most of my questions, and when I was stumped the Homestead email support representatives had the solutions I sought. Chat support is available if you already have an account with the company, but not if you’re still in the decision-making process. For answers to questions before you’re a customer, you can call 1-800-710-1998, the Homestead website phone number for support. When it comes to Homestead website SEO, the platform provides a variety of helpful resources to teach you what you need to know about search engine optimization. A Homestead website tutorial covers all of the basics, and includes things to keep in mind when building your site. If you’d like more help with SEO, though, you can recruit Homestead to help you out with that. They don’t have an advertised plan or price, but they do offer advanced SEO services. Get a free consultation when you call 1-888-412-9962. 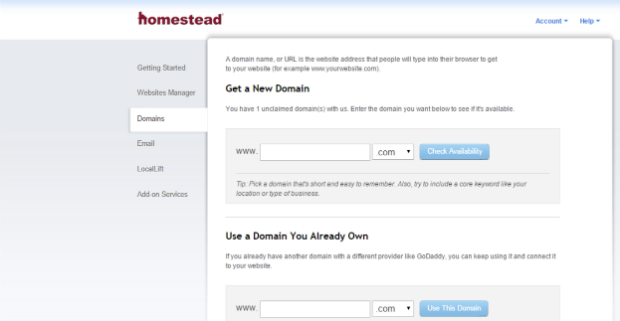 Homestead Web hosting is included with all of its plans, and there’s no additional cost for it. If, however, you ever want to migrate your site to a different company’s servers, there’s no way to do it. There’s no export option in Homestead’s hosting services, meaning there’s no way to transfer your site to a different platform. Many other builders do give you this capability, and it’s a shame homestead doesn’t. 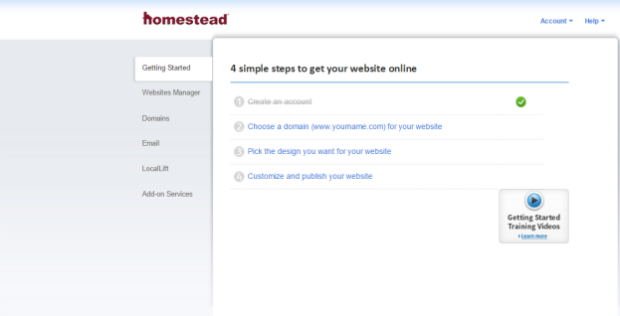 When you sign up for a Homestead website design plan, you get five custom email addresses for your domain. You can set up those email addresses to work with an email client like Outlook or Apple Mail, or you can use the Homestead website email interface to read and reply to emails from any Internet-connected device. Like the rest of Homestead’s interface, the layout of the webmail screen is clean and easy to use, yet it’s not the most full-featured email service out there. Most Homestead website reviews give the builder mediocre marks because it’s lacks cutting-edge implementations, and is priced quite a bit higher than even some of the best builders on the market. That said, there are many diehard Homestead fans who’ve been using the builder for years and continue to swear by it. One thing that’s great about this builder is that it offers users a free-trial of the service for 30 days. Homestead free websites aren’t limited in any way, and you can try out the three main plans before committing to them. A part of the process I wasn’t thrilled with, though, was that I needed to enter my credit card information before signing up for a free Homestead site. Not a huge deal, I’ll admit, but I still prefer builders you can play with without whipping out your wallet. All in all, Homestead is a solid little builder that’s been around for a long time and is good at what it does. Unfortunately, the platform hasn’t adapted well to the times, and continues to lack some features that many other builders offer as standard. If all you need is a decent website that looks good on desktop computers, Homestead is definitely worth taking a look at. If you’d prefer something more modern, though, or if you just want to save a little cash, there are better builders out there, than you can use for less money.